You must be very familiar with the file format DOC, which is a type of MS Word file format. Why do people want to convert DOC to XPS? What is XPS? Well, XPS (XML Paper Specification) is a Page Layout File format which is developed by Microsoft. A XPS file can define the layout, appearance, and printing information for a document. The XPS format provides a way in which you can easily create, share, print and save digital documents. It is similar to a .PDF file. 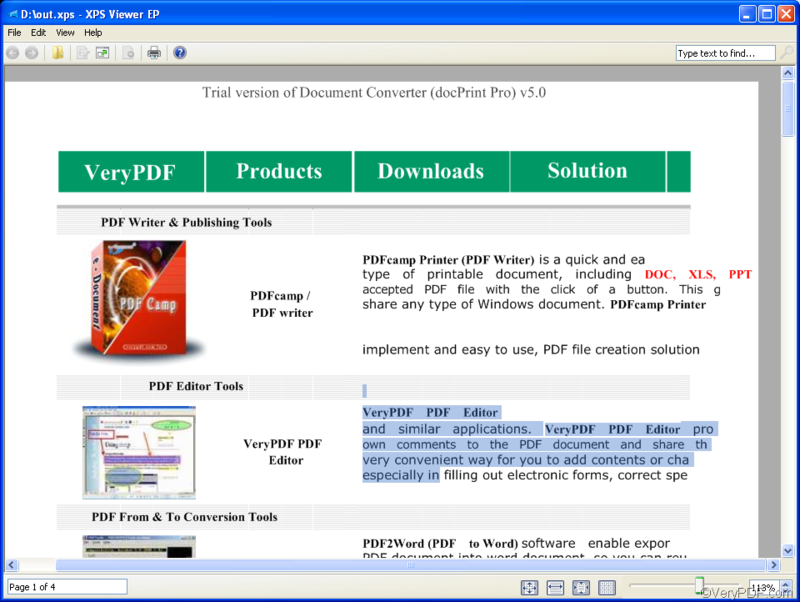 When you want to convert DOC to XPS, you can try VeryPDF Document Converter Professional which also named docPrint Pro. VeryPDF Document Converter Professional provides multiple versions including the command line version, the GUI version, etc. Since you want to convert DOC to XPS via command line, you should use the command line version to solve your problem. The following introduce the way to take three steps to convert DOC to XPS via command line. First of all, you should Download the command line version of VeryPDF Document Converter Professional. After you install it on your computer you can get dozens of times to use it free. By the way, if you want to buy it, please click Purchase. The second step is to open the command prompt window. VeryPDF Document Converter Professional supports all versions of Windows operating systems (OS). In different Windows OS, it requires different ways to open the command prompt window. 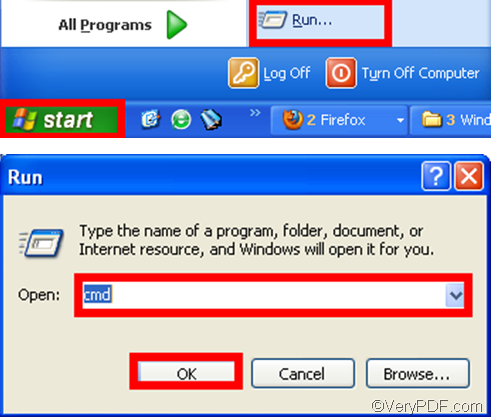 For example, if you are in Windows XP, you can do as follows to open the command prompt window: click Start, > click Run, > type “cmd” in the Run dialog box that pops out. > click OK in the Run dialog box. The third step is to type a command line in the command prompt window, when it appears on the computer screen. You should follow the basic usage: doc2pdf [options] <-i input file> [-o output file]. The square brackets mark the options, and the angle brackets mark the essential items. -i stands for input, and -o stands for output. For example, the following command line can be used to convert a single Word file in the format DOC to a XPS file on my computer: “C:\docPrint Pro v5.0\doc2pdf.exe” -i C:\in.doc -o D:\out.xps. If you want to convert many DOC to XPS in batch, you can use a wildcard * to represents all the files in one folder. For instance, “C:\docPrint Pro v5.0\doc2pdf.exe” -i C:\*.doc -o D:\*.xps can be used to convert all the DOC files in the root folder on disk D to PCX. After you type a command line according to your computer, don’t forget to press the key Enter on your keyboard. After the conversion is done, you can view the effect of conversion from DOC to XPS. The following is an illustration of the comparison between a DOC file and its result XPS file. 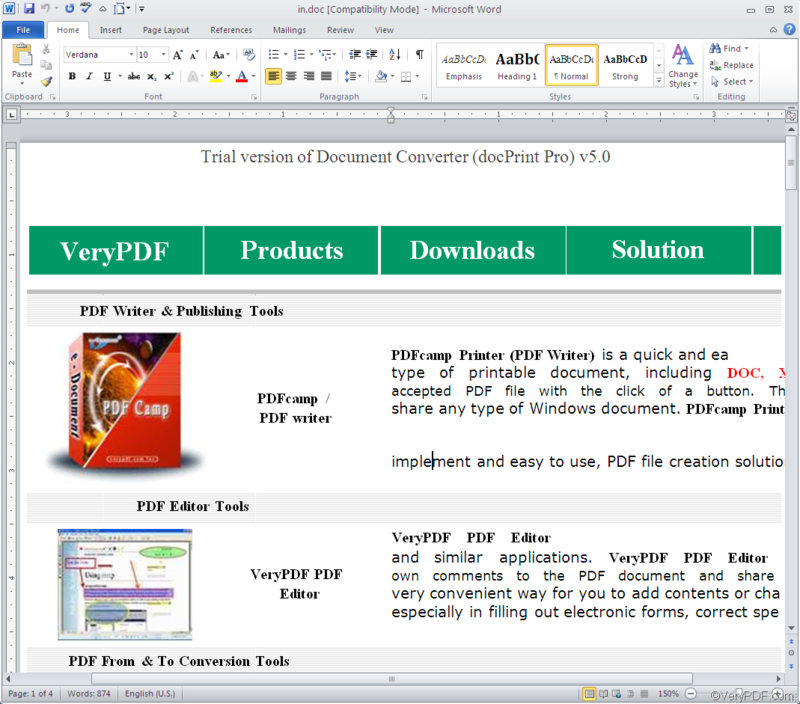 Only three steps are required to solve all your problems, why not try VeryPDF Document Converter Professional right way? If you have any question, please leave a message. Thanks for your reading. How to add a frame to each page in docPrint preview application? How to convert documents of OpenOffice to JBIG?